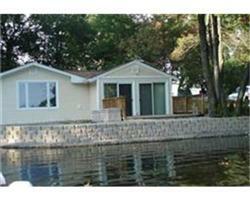 Enjoy breathtaking views of Bungay Lake from your own waterfront home, also known as “ISLAND #5”! Boating, swimming, skating, fishing, and water skiing make this property the ideal year-round vacation without the commute! This contemporary ranch offers an open floor plan and many updates including a remodeled kitchen with a center island, newer bathroom, roof, and replacement windows. It also includes a large deck perfect for entertaining outdoors. This unique property won’t last long! 262 Plain Street, Mansfield, MA. $219,900.